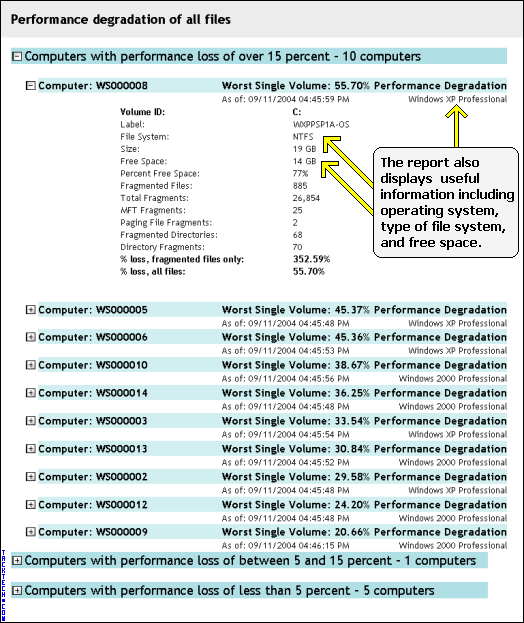 Executive Software: Disk Performance Analyzer for Networks (Software Review) - TACKtech Corp. Description: The Disk Performance Analyzer for Networks is a stand-alone utility that detects and reports fragmentation-related performance loss on networked systems. It provides this never before available, easy to use functionality all from a single location. After installing and launching the utility, you are presented with a list of computers on your domain(s) available for analysis. Once you have selected target computers, a small agent is temporarily copied to these computers to begin an analysis. The agent quickly and unobtrusively gathers disk fragmentation information from the remote computers and reports this data to the Disk Performance Analyzer for Networks main console. The agent then completely removes itself from remote client systems. 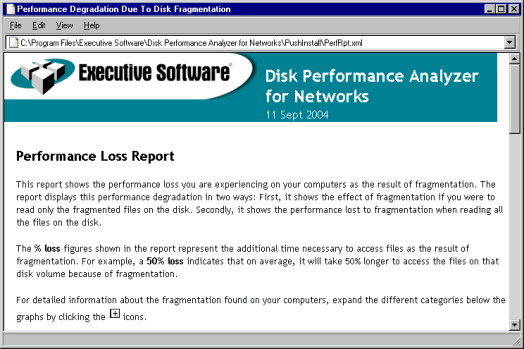 After collecting all the analysis data, Disk Performance Analyzer for Networks will create and present a comprehensive report showing the fragmentation related performance degradation on selected remote computers. Note: Service Pack 2 for Windows XP (SP2) contains a number of security-related enhancements to the operating system. Some of these enhancements affect the operation of certain network functionality in Executive Software's products. Before using DPAN on systems running Windows XP SP2, be sure to refer to the information presented at www.executive.com/sp2. When Disk Performance Analyzer for Networks launched, you are presented with a Wizard. due to fragmentation on the remote computers. 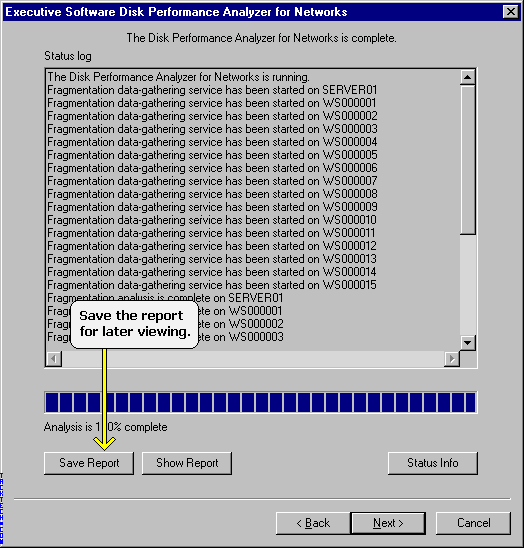 provides a quick overview of the performance degradation. 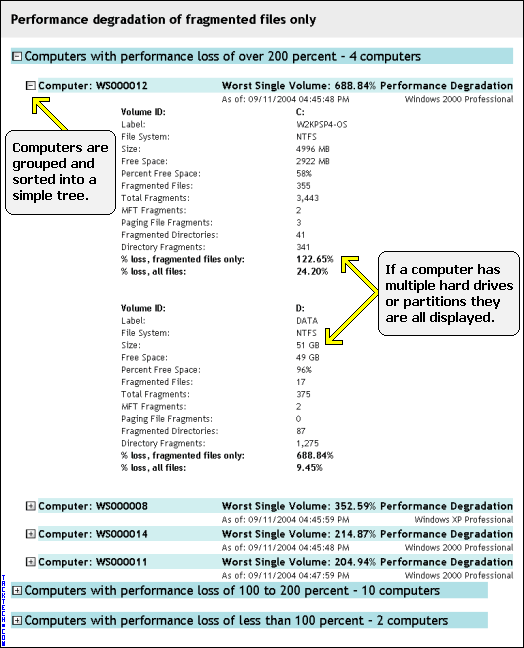 Computers are the grouped by performance degradation of fragmented files only. Each of the three percentage groups are sorted so the worst is at the top. Detailed information about the fragmentation of each computer's volumes is displayed. 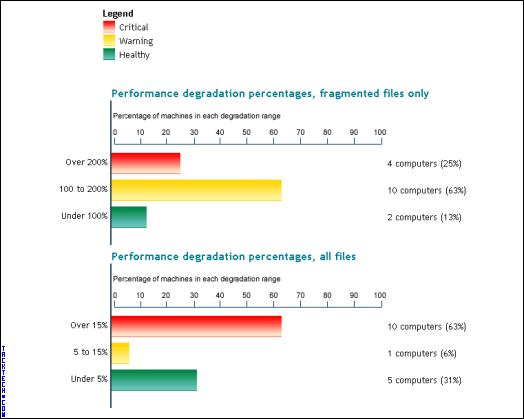 Computers are also grouped by performance degradation of all files. Other information is also displayed such as the computer's operating system, file system, and free space. One other great feature is the ablity to save your reports for later review and comparison. Make the auto launch of the Performance Loss Report optional. Allow blank passwords. Even though security is important some people just don't want passwords. Allow the entry of different passwords for each workstation. Global administrative accounts can be hazardous. History management for previously saved reports. Over all Disk Performance Analyzer for Networks can serve as a valuable tool to administrators of Windows networks.